The touring club produced maps for Vacuum Oil Company R.T. (Mobiloil and Sphinx Benzin) in at least 1934 and 1937, which can be considered as petrol company issues, even though they carried advertising from other car related businesses as well. The Magyar Touring Club map did not just work with Mobiloil/Sphinx; in 1937 it also published a two-colour map of Hungary with Shell advertising internally. It locates towns with Shell petrol or motor-oil sales by a red triangle or disc, and the reverse is devoted to a large promotion for Budapest in English, French, German and Italian (but not Hungarian), with large b/w photos. The main map side carries many small adverts for banks, hotels, garages and other facilities, as well as for Shell Motor Oil. After the Second World War, Hungary soon fell under the control of the Communist party, which established a one-party state in 1948. After the failed revolution of 1956, the Hungarian Government permitted a greater degree of economic freedom, for example through the New Economic Mechanism of 1968. Shell had for many years been permitted to operate a single station in central Budapest, and under the N.E.M. this was extended to allow Agip and BP to develop small chains of service stations alongside Shell and the former state monopoly company Áfor. In the early 1970s BP invited potential tourists to write in for a map of Hungary showing their 8 filling stations. I have never seen the map they sent, but this BP Touring Service (left) map dates from ca1965, a few years before they started selling fuel in the country. No cartographer is credited on a fairly basic map at 1:1.5 million, which also covers Czechoslovakia. The Hungarian Tourist Board would freely send out a much better map at 1:650,000, which marked all petrol station locations. This example (right) is undated, but was obtained in 1985, and states 'All over the country petrol and diesel oil can be bought at ÁFOR, AGIP, BP and Shell stations as well as at various garages.'. In 1989 the Communist Government was defeated in the first free elections since the 1940s, and the market gradually became fully liberated. In 1992 MOL Magyar Olaj- és Gázipari Rt. was set up to take over the bulk of the Hungarian oil industry, including many of the service stations previously under the state-owned Áfor brand, which was finally phased out in 1997. 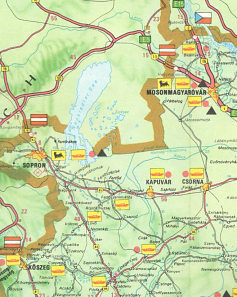 In December 1997 Híd Marketing prepared the map (near right) for free distribution by MOL. Drawn to a scale of 1:550,000 using good modern cartography, it marks all places with MOL stations and has 24 town plans on the reverse, again locating MOL outlets. Addresses and hours of opening are given for all MOL locations, including those in Romania, Slovakia and the Ukraine. The spiral-bound atlas (above centre right) is the second edition of 2000 by DIMAP of Budapest. It has 82 pages of detailed maps at 1:250,000, followed by town plans and an extensive index. 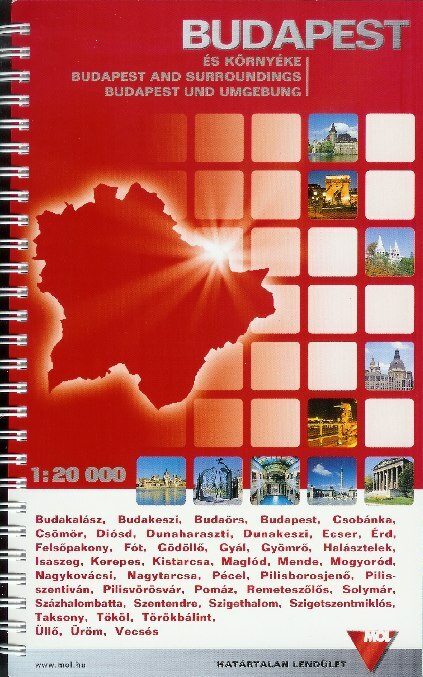 By 2005 MOL had moved to a predominantly red cover design; as well as a national map of Hungary it also sold a plan of Budapest, both prepared by DIMAP. In 2007 the country map was attributed to Szarvas András, although using the same basic cartography. The Austrian company OMV was among the first new entrants into the Hungarian market. This OMV atlas of Hungary dates from 1991, about the time that it first started operating service stations in Eastern Europe. Although the front cover is in German, on the inside covers there are adverts for OMV service stations in both German (front) and Hungarian (rear). The atlas was assembled by Freytag-Berndt u. Artaria, but appears to use maps drawn by the large Hungarian firm Cartographia. 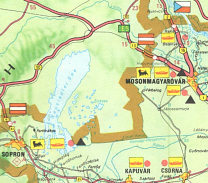 By 2001 (near left) OMV's Hungarian chain was large enough to publish its own sheet map of Hungary at the scale of 1:700,000, with a special map of Budapest. Shell consolidated its position as the second largest brand in the Hungarian market after its liberalisation. The first map shown here is something of a curiosity as it has no real cover, and was funded by advertising from businesses based in the region SW of Lake Balaton. These were mainly from hotels and independent garages - including an Avanti garage and the Fan Fan filling station shown here! The anonymous map itself, and inset city plan of Budapest, mark all Shell locations including those planned to open during 1993. The other map (right) was an official Shell issue dating from 1998. Cartography was by GS-Hister (Top-O-Gráf) at 1:1,000,000 with a large plan of Budapest and a station list on the reverse. The other map shown here is from a German set of 1997, also covering the Czech and Slovak Republics. It only marks Aral locations outside the larger built up areas, although the legend indicates that all stations are shown, thus suggesting (wrongly) that there were only about 5 Aral sites in the country. It was prepared by Busche, at 1:750,000. 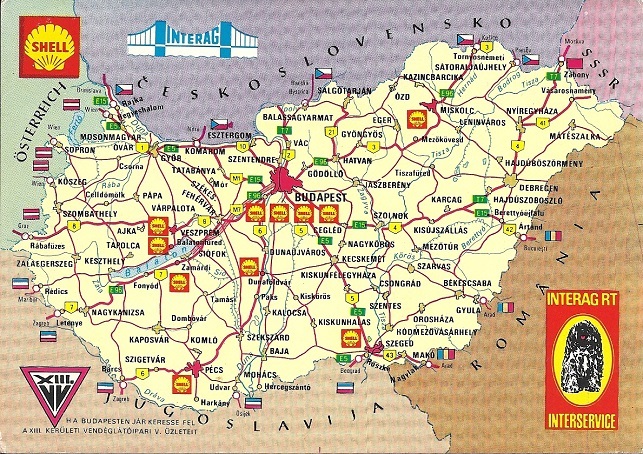 Agip only sold a 2006 Cartographia map of Hungary at 1:450,000, pasted with an index into its own card covers. The 2007 edition of the same map (and index) was sold by OMV, along with a Budapest city map and Hungary/Budapest atlas. Between (at least) 2000 and 2006, some Shell stations sold a cheap locator map from Top-O-Gráf of Hungary backed by Budapest with a cover promoting its 75th anniversary in Hungary. Early versions could be paid for by 10 SMART points, or 50 Ft; later ones had no cover price. 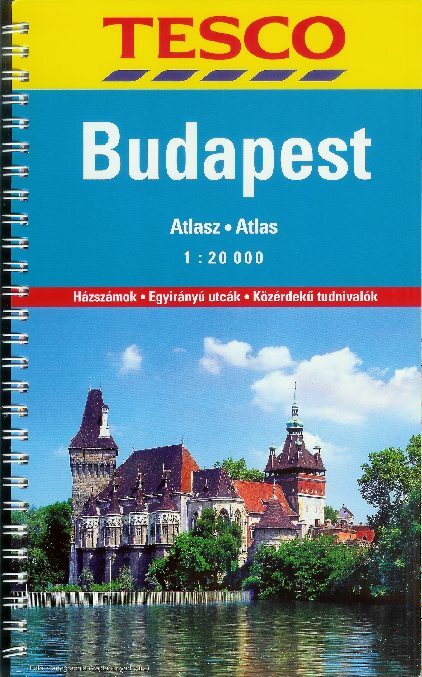 MOL, Tesco and Shell all sold three atlases, of Budapest, Hungary and Europe. All were medium format and spiral-bound, except for a larger hardback edition of Europe from MOL (not shown). MOL's were produced by Dimap; Tesco's by Cartographia; and Shell's by Freytag-Berndt of Austria. Generally, the Tesco atlases were the lowest price (and arguably the best value even though they had slightly less coverage), and the Shell titles most expensive. MOL supplemented its atlases by sheet maps of Budapest and Hungary (as shown above). All the Budapest atlases were at 1:20,000; MOL's atlas had a separate section at the back for Eastern and Western suburbs; these were covered in the main section by Shell, but omitted from the Tesco atlas. 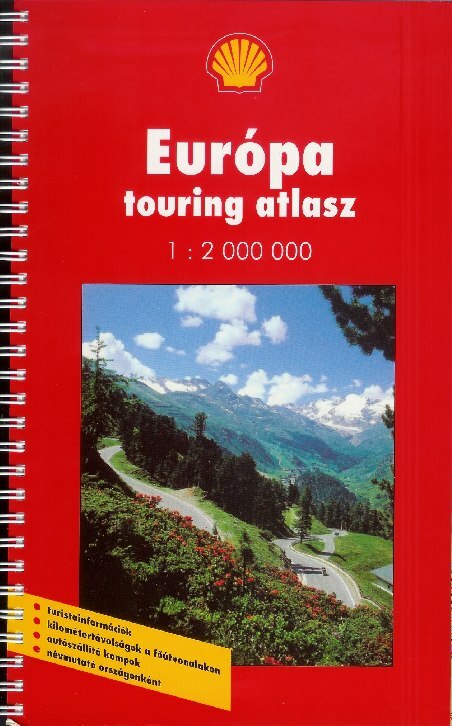 Similarly all the Hungary atlases were at 1:250,000. Shell's Europe atlas covered a noticeably larger area than Tesco's, at a uniform scale of 1:2 million. Broadly centred on Hungary (or Vienna), its coverage extended unusually far into South and East Europe, including most of Georgia, Armenia and Syria, as well as part of Iraq and Russia as far East as Moscow. Despite this it also included Iceland at the same scale. One reason for the high price of the Shell atlases may be that they are generally used as gifts for collectors of Shell's points, rather than sold. Among other recent brands, it is known that Jet published branded maps before they sold out to Russia's Lukoil in 2007 and likely that BP (which sold out to OMV 2003), Esso (which sold out to Agip in 2007) and Total (which swapped its chain for some German Shell outlets in 2004) have as well. The Austrian independent firm Avanti may have had its own maps before it sold its outlets to Lukoil in late 2004. Please send me an e-mail if you can help me with these, or with any other brands of petrol shown on Hungarian road maps.